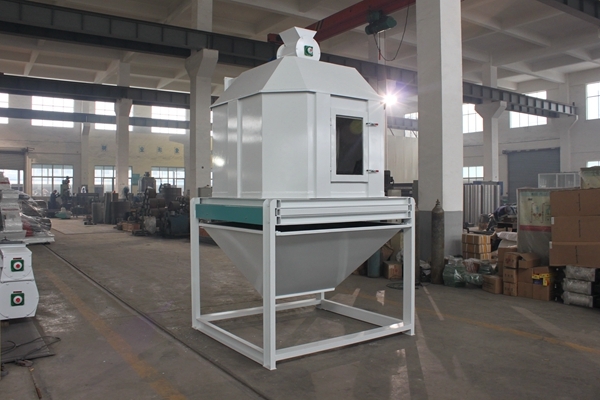 Introduction of heat energy conversion in the process of feed pellets drying and cooling - Wuxi Huamu machinery Co.,LTD. The material with higher moisture is evaporated by absorbing heat from the drying medium. At the same time, the temperature of the drying medium itself is reduced due to the release of heat, and the water evaporated from the material flows out of the drying system as the drying medium flows. The supplementary drying medium absorbs the heat released by the steam in the heat exchanger and the temperature rises. At the same time, the steam turns into condensed water and leaves the heating system. Compared with the drying process, the natural state of clean air is used as the medium in the cooling process, and the materials with certain temperature and moisture are cooled and dehumidified. Take the common counter-flow particle cooler as an example: In the cooler, the flow of material is from top to bottom, and the cooling air is from bottom to top, forming a reverse flow with the material. The lower material provides the heat required for water evaporation and air temperature rise during the top-down process, and the temperature is close to the ambient temperature. The upper part of the air absorbs the heat released by the particles during the process from bottom to top, and both the temperature and the wettability increase. Thus, the purpose of cooling and dehumidifying the feed pellets is achieved. The hot and humid air after work is discharged from the cooling system by a cooling fan. Usually in some special occasions, when the material production process allows, sometimes we will achieve the drying and cooling process of the material through the drying and cooling integrated machine. The mechanism of the drying and cooling process in the drying and cooling integrated machine is basically the same as described above. However, there are some differences in the drying and cooling processes and effects with different configurations of the air paths. For some special materials, such as shrimp, the maturation degree is relatively high. After being extruded, it still needs a period of time to further heat and heat treatment. This process is usually carried out in a stabilizer. Generally, the stabilizer is made into a jacket type, and a certain number of steam pipes are arranged in the inner cavity to keep the temperature in the cavity stable at about 100° C, so that the material is further matured and stabilized. In this process, steam is continuously consumed, and the heat energy of the steam is continuously transmitted to the material through the wall of the pipe, so that the temperature of the material is increased and matured.